The release of the 2016 KCSE results late last year generated a lot of interest. These were the most credible national examinations results in a long time. The highlights of the results were the reduced number of students who managed to score the aggregate A Grade and the decline in performance in a number of subjects including English, math and chemistry. Despite all these odds, Strathmore School emerged the top school in the country in three subjects: math, English and French. This success was undoubtedly the fruit of the hard work of the candidates with the support of the parents and teachers who generously gave themselves. The firm foundation that our students receive in Form 1 and 2 in English especially by inculcating the reading culture through the reading of English classics is largely responsible for the good performance in the subject. As any good teacher of English will tell you, success in productive skills in language: Speaking and writing is heavily dependent on receptive skills: reading and listening. The school’s investment in IT in the classrooms has also gone a long way in improving the teaching of languages. Students can now watch videos on speaking skills, oral literature and set books in class. This has contributed in the enhanced performance in English and French in the national exams. 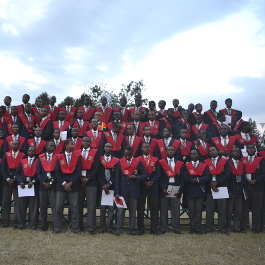 For a long time now, Strathmore has been the top school in mathematics in KCSE examinations. This culture of excellence in mathematics has been maintained through the shaping of the attitudes of the students. The teachers of math have continuously inflamed the students with their passion for the subject. Even the students who might have joined the school with a defeatist attitude towards the subject have been transformed over time. Of course, this has been complemented with a lot of hard work on the part of the teachers and the students. We cannot take this success for granted. We wish to thank the parents of these candidates for the support they gave their sons to realise these good results. Being a day school, Strathmore heavily relies on the support of the parents in ensuring that the students keep disciplined work habits at home, in ensuring that the students report to school on time and also by ensuring that the students welfare is generally well taken care of. Our parents have never disappointed us! We also wish to thank the teachers who handled this class at all levels, right from Standard 1, for their gallant efforts. They did not labour in vain. And of course to the 2016 candidates for proving yet again that discipline, academic honesty and hard work pays. We cannot forget the Ministry of Education led by Dr. Fred Matiangi and the Kenya National Examinations Council led by Prof. Magoha, himself a past student and past parent of Strathmore, for restoring integrity in our National examinations and giving hope to millions of Kenyan youth! We wish our 2016 candidates and their families the best of luck as they move on to their next phase in life. You can count on our prayers and good will.